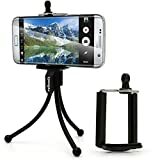 Bendy wire mini tripod with adjustable and detachable mobile clamp holder. Made from flexible metal and durable plastic. Features 3 adjustable legs. Can be placed standing on tables, shelves, walls or ground. Retractable & fits mobiles with 55mm – 80mm widths. Springs and the rubber pad at top clip your device tightly. Rubber feet for stable positioning. Lightweight, compact and sturdy. With clip for attachment to pockets, camera bags or belts, etc. Only 45 grams & 12cm (legs closed). Completely flexible and versatile, it simply clamps to your smartphone in seconds. The iGadgitz smartphone tripod mount is easy to install and convert your smartphone into a digital camera. The standard smartphone brackets automatic elastic stretch can clip 55-85mm width phones. This entry was posted in Discount Photography and tagged Adapter, Alpha, Bracket, Edge, Flexible, Galaxy, Holder, iGadgitz, Mini, Mount, S7/S7, Samsung, Smartphone, Standard, Tripod by Ball Photo. Bookmark the permalink.